This month’s column is prompted by an ad I saw at Brisbane airport recently urging us to fly Air Asia to Phuket, Thailand. One can’t read it without activating the alternative, phonetic pronunciation of ‘Phuket’. It reminded me of another ad fo Sofa King furniture in USA. It claimed “Our prices are Sofa King low”. Also clever... but not quite so clever. I did a column some time ago on double meanings and how they add impact to an ad (see A Pun is its own Re-word). So this column focuses on swearing. The reason for incorporating swearing in an ad is in order to slipstream its emotional impact and its attention. The idea of slipstreaming is to hitch a ride on things that gain attention or otherwise give impact. I have written elsewhere about hitching onto various things such as topical events or celebrities or pop expressions, or sexual images. Swearing is yet another one but it is trickier. Swearing is a form of taboo violation and as such it attracts attention. We swear to express frustration and anger and to release tension and also for emphasis but the effect on others is to connote strong feelings and emphasis and to trigger an ‘orienting response’. It is claimed that swearing accounts for about 3 percent of all adult conversation at work and about 13 percent at leisure. Indeed, reportedly in the USA, 72 percent of men and 58 percent of women swear in public. Despite it being common in everyday life, swearing is rare in advertising because of the risk of offending people. The minority of people who don’t swear are the ones most likely to be offended but advertisers don’t want to offend any paying customers, even minorities. The trick to slipstreaming swearing is to tone it down and use implicit rather than explicit swearing. This is why the Phuket ad is so good. Of course we realize that our interpretation of it is ‘channeled’ by the verbal construction of the ad but there is a sense in which we also realize that any vulgarity emerges from our own mind almost as much as from the ad itself. Here’s another example of implicit swearing that relies on ‘self completion’ by the reader and where offence is likely to be cushioned as a result. With this ad, Mitsubishi uses the headline: “What the …?” Of course, you insert your own missing bit and thereby realize that any vulgarity is emerging from your own mind as much as the ad. Another tactic is implied swearing. 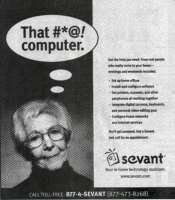 Consider this ad for Sevant where implied swearing is used as a visual hook to get attention for an in-home, technology assistance service. 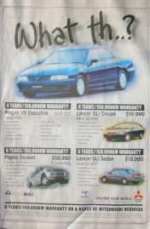 The ad signifies censored language and anything censored is an attention magnet anyway. Worth noting also is the visual incongruence. Who would expect a sweet little old lady to be swearing? As a result, not only does the implied swearing get attention but the visual incongruence activates what I call the mind’s intruder alert - see Capturing Attention By Triggering the Mind's 'Intruder Alert'. The audio equivalent of this implied swearing is bleeping. An example of using bleeps in a TV ad is this ad is for Bud Light called “Swear Jar”. When the bleeps only partially mask the swearing and the context leaves it and the intent of the advertiser exposed, it is more problematical whether it would work for any product other than perhaps a macho product like beer. Another tactic is to mentally trigger a well known swear expression but the words in the ad only sound like that expression. Here’s an example “Sit, Shower Shave” – an ad for Virgin Atlantic’s upper class arrivals lounge. Importantly, the words ned to have integrity of meaning in their own right (you can sit, shower, shave when you arrive) but they additionally trigger something else – another expression that is very familiar and sounds similar. This Virgin ad, just like the Phuket ad, is unlikely to give offence because any offensive interpretation is self-constructed and clearly emerging as much from our own mind as the ad itself. It is not just beauty that is in the eye of the beholder. When the reader ‘gets it, ’clever ads (just like humorous ads.) result in greater appreciation and liking for the ad. Their essence is the reward hit that comes from appreciation as the ‘ahaa’ reaction kicks in. People like clever ads and if they are well executed, the liking for them washes over onto the advertised brand. Liking and appreciation of an ad doesn’t necessarily make it work – but it helps. That’s why it is important when using swearing to avoid giving offence and put the emphasis on clever over crude. 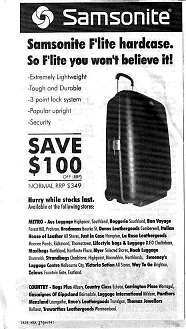 Possibly the best I have seen in this reward stakes is this ad for Samsonite F’lite luggage… So F’lite you won’t believe it. 1. McQuarrie, E. F. and D. G. Mick (1996). "Figures of Rhetoric in Advertising Language." Journal of Consumer Research (March)..
Download a PDF Copy of "The Swear**g Effect in Advertising"